Usually, landlords look for renters who do not have any pets. The reasons are quite simple and easy to understand, no pets means no property damage. Landlords feel concerned about their properties since pets are not always well behaved and their owners don’t always take care of them, so the best strategy is to avoid renting to tenants with pets. But is it really a wise and profitable decision on the landlord’s part? Let’s consider the scenario, you meet a really nice couple who seems to be well educated, professionally well-settled in their jobs, willing to pay your rent and look like they are pretty disciplined and organized. But, this ideal family has a pet dog with which they share a passionate relationship. So, what would you do in such a situation? Will you let them go just because of the prospective tenant’s pet dog? Or, you will give it a try and see how it goes? We suggest that you opt for the second. You also should not forget that those who keep pets are sympathetic and loving/caring individuals at heart and such people are valuable members of the community. There is an unparalleled sort of bonding that develops between humans and pets. Usually people who are keeping pets are quite reliable in terms of property maintenance and rent payment. Why? 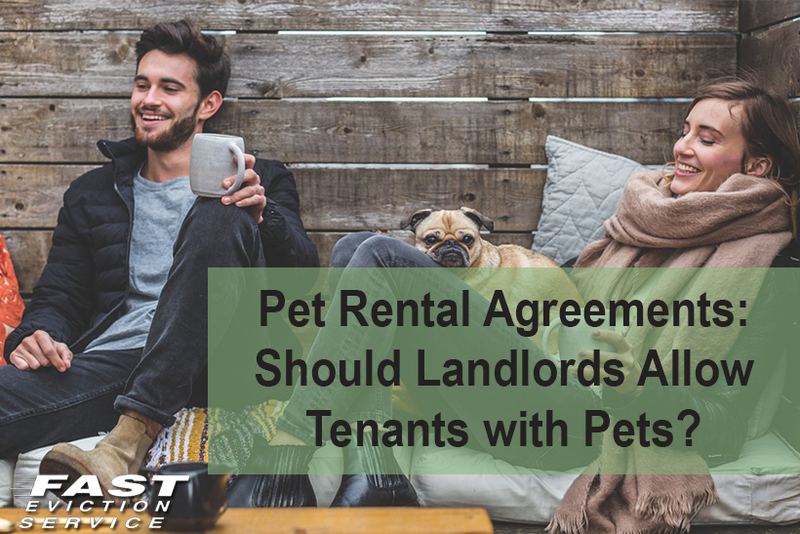 Because they know not many landlords would allow tenants with pets, therefore, they want to make the most of the opportunity and try to be good tenants by paying rent on time (sometimes even before the due date) and making their pet behave in a disciplined manner. Moreover, most common pets include cats and dogs and in the UK and USA, keeping dogs is a clear preference. As you know that dogs tend to be very protective of their masters and hence, they try to serve as a protector of the entire property. They have pretty sharp senses of smell and are able to assess any upcoming or incoming threat right there and then. So, you can expect your property to be protected from invasion of burglars, thieves and criminals and even neighborhood stray animals. Generally, pets perform the job of security guard for their master’s property and when it is your property where a pet resides you can sleep peacefully at night as the pet will be watching it from every angle. Furthermore, landlords can easily ask for higher rent since a majority of landlords don’t allow renting to tenants with pets and those who do are in minority. You can benefit from this trend greatly as renters are somewhat vulnerable due to their pet and hence, would agree to all your terms and conditions along with higher rent. Similarly, landlords can ask for higher deposit if they allow tenants with pets. Renting to tenants with pets instantly exposes your property to a wider audience and will increase chances of finding the right tenants considerably. In a recently conducted survey by Dogs Trust around 78% pet owners find it difficult to rent an accommodation where landlords allow pets. Another fact is that a hefty number of families own a pet. Such as in the UK, 45% of the total population (nearly 4 million households) have a pet. This means by not allowing pets, you are letting your potential market decrease by 50% at least. You can expect your tenants to behave well and retain the property for longer duration simply because they would know there aren’t many options for them. They would want to keep you happy as a tenant by being extra gracious, helpful and supportive so that you let them stay on your property on long-term basis. You need to keep in mind the following points in order to have a safe and healthy experience renting to tenants with pets. We suggest that you get a Tenancy Agreement contract containing specific clause related to renting with pets. These special pet clauses will state the responsibilities of the tenants such as they will be required by law to keep the litter trays clean and provide proper treatment facility to their pets in case of illness, etc. Also, the tenancy agreement will contain a section where the name, address and contact number will be provided to deal with the situation if there is an emergency. Landlords can add a clause to request for non-returnable pet payment in which the costs of property clean up by a professional team after the tenant moves out will be covered. Renting to tenants with pets requires special consideration and clauses included in a pet rental agreement. But you may find the rewards well worth it if they can meet your requirements and at the same time help protect the value of your property and reduce tenant turnover by taking a close look at your policy regarding renting to tenants with pets.